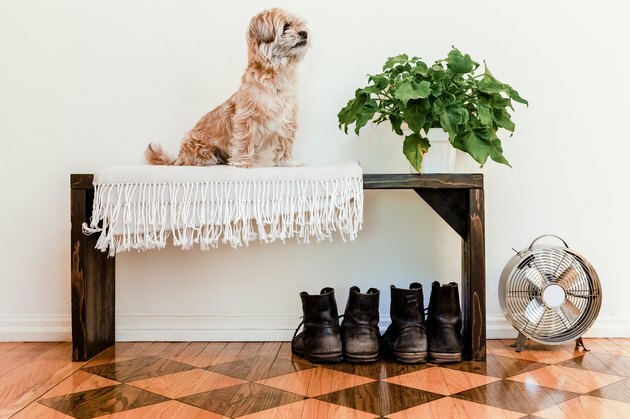 Once you've made the decision to splurge on wood floors, you'll want to choose furniture and accessories that enhance their beauty. It may not be obvious, but using wood elements in combination with hardwood floors can actually highlight the beauty of the floors themselves. Hardwood floors can be completely customizable, so work with a certified professional to discover what speaks to you personally and then accessorize your home accordingly. Below, some pro interior design tips to help get you started. Dark stained floors, such as Bona's DriFast Ebony, provide a more sophisticated, urban feel that will stand the test of time. However, dark furnishings can get lost against the backdrop of a similarly toned dark wood floor. To break things up, consider pairing light furniture with flooring that has a darker stain. For example, if your family room has dark wood floors go for a side table in a whitewashed mango wood. The light color will set it apart. If you already have dark furniture in your room, don't panic. Simply adding light wood accessories like this carved decorative wooden chain or this Paulownia wooden bowl will help create contrast and keep the eye moving around the room. 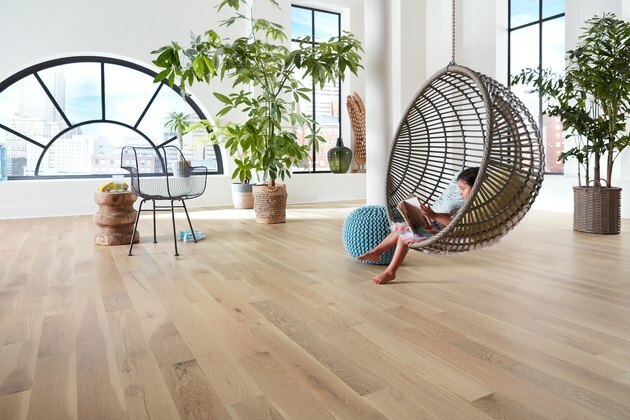 Light wood floors such as Bona's DriFast Birch or White can give your home a modern, minimalist feel, and they also tend to make spaces feel a bit larger. They have the advantage of hiding more dirt, as well as making scuffs and scratches difficult to see. That being said, combining light wood floors with furniture and accessories of the same tone could result in a bland palette so don't be afraid to mix in darker woods and color when it comes to decorating. If your dining room has blonde floorboards, vintage Moller rosewood dining chairs or Dane Upholstered Dining Chairs with a pecan-stained finish will stand out nicely. A credenza in luxurious walnut will add depth and layers to your space, as will a live-edge black American walnut dining table. Wide plank wood floors with a highly visible or open grain are popular right now. They impart an overall casual, bohemian vibe that will instantly give your home a warm and inviting feel. 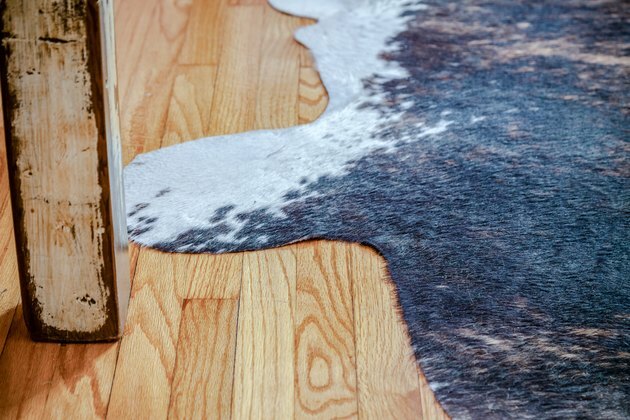 You can acquire this by wire brushing a floor and then using a penetrating oil or blend to enhance the grain and allow for a subtle design element that is completely unique to your floor. Since you can see the grain of the wood clearly and it creates its own design element on the floor, you'll want to balance this more relaxed look by choosing furniture and accessories that have a tighter, or less visible, grain. For example, in a living room with open grain wood flooring, consider a tight-back sofa trimmed in a more formal small grained wood like the Arcata Sofa from Ethan Allen or the Raleigh Sofa from DWR in either walnut or oak. Add in a table like the Port Coffee Table from DWR – its beautifully sculptural legs in either oak or walnut would be a nice juxtaposition to the casualness of open grain floors. Walls and ceilings are sometimes overlooked but provide a great opportunity to add wood elements that will accentuate your floors while drawing the eye up. A teak mirror has just enough detail to make a statement without overpowering, and a woven rattan hanging pendant incorporates the casual feeling of the floors without looking messy. As you might suspect, a tight grain wood floor is the opposite of an open grain floor; it has a dense consistency with less pronounced or visible pattern. By nature, it tends to give interiors a more formal appearance, regardless of the color it is stained. If you have a collection of antiques and are trying to achieve a more orderly effect, then select furniture and accessories that have tight wood grain as well. However, if you're looking to juxtapose the more formal floors, select furniture that reads more casual. For example, if your bedroom floor has a tight grain, consider anchoring the room with a dresser made from solid reclaimed white oak timbers. Or, place a catchall bowl made from beautifully imperfect maple on a bedside table — it would be a lovely counterpoint to more conservative flooring as well. When selecting wood furniture and accessories to complement your wood floors, remember first and foremost to choose pieces you love. Then consider the color of your floor and pattern and choose pieces that create a bit of contrast and visual interest.